Are you looking for the simplest shopping experience when buying CBD oil? If so, this guide may be exactly what you need. As a CBD enthusiast, I know there are certain cannabidiol brands that are superior to others. This is based on the quality of their products, the friendliness of their customer service, and more. It can be difficult trying to make sense of who’s a reputable CBD company and who’s less trustworthy, though. If you’ve been considering trying out CBD, this is your sign to give it a go! We’re going to provide you with a comprehensive review on CBDPure’s CBD oil so you can finally see what all the fuss is about. You’ll hear my personal experience trying out the brand as well as my pros and cons for the product. If you’ve been wanting to try CBD but haven’t quite taken the jump, let’s dive into our CBDPure CBD Oil review guide to give you one more reason why you should try. Founded in 2016, CBDPure has a simple mission in mind: make the highest-quality CBD oil available on the market. With that mission came a goal to always back their CBD oil with public third-party lab test results – plus an astounding 90-day money back guarantee. Proud of their reputation on the market, CBDPure boasts of the mere 2 ingredients in their oil: unprocessed natural hemp oil as the base, finished off by highly potent cannabidiol. As they claim they’re committed to purity and quality over quantity, I was eager to try their CBD oil. CBDPure also sells CBD softgels, which can be taken easier for those who don’t enjoy the sublingual method of dosing with hemp oil. Instead of holding oil under your tongue for 60 seconds, you just take the softgel with water and wait for its effects to kick in. Though the softgels are becoming ever more popular on the market, and I’ll probably try them in the future, I only tried the various CBD oils for the purpose of this review. 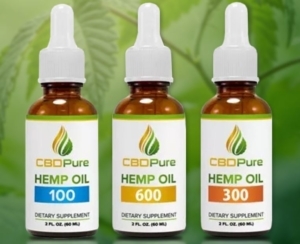 CBDPure sells a 100MG, 300MG, and 600MG bottle of their CBDPure Hemp Oil. I started with the 100MG bottle first. Though there’s 1 gram of full-spectrum hemp oil per serving for each of their CBD oils, half a dropper contains approximately only 1.6MG of cannabidiol for the 100MG container. This would probably be best for people who have a very low tolerance to cannabinoids. The 300MG bottle was next, which contains 5MG of CBD for every gram of full-spectrum hemp oil. At 2 half droppers of 5MG a day, this was a slightly stronger oil that would probably work for the most people. It wasn’t overwhelmingly potent, so I could see using this as part of my daily routine. Finally, I saved the sampling of the 600MG bottle for last. As I’m familiar with CBD and have built up a bigger tolerance over the years, I knew this would likely be the most effective for me. Differing levels of tolerance is what it boils down to for which CBD oil is going to be strong for you. Each half dropper of the 600MG bottle is 10MG of pure CBD, which I dropped under my tongue and held for 60 seconds before swallowing. The effects were more immediate than the other two products, though not by much – they were all relatively immediate, after all. Overall, CBDPure is full of dedicated experts that are putting together premium-quality products. I was impressed enough with the CBD oil to recommend it to anyone else that may be considering trying out CBD. Likewise, it’s particularly a great option for those who want to maximize their wellbeing and health. Half a dropper is recommended twice daily, allowing for better focus and more energy in the morning and the ability to get to sleep easier at night. You’re left with a deeper, better sleep at night, more productivity to get things done throughout the day, and a better quality of life as a result. While different CBD products work for different people, I would have to strongly recommend the CBDPure hemp oil to get the maximum potential.